Roman shades at Houston Blinds For Less are quickly becoming one of the most requested window coverings due to their elegant and efficient design. Custom fabric Roman shades not only offer the primary benefits of a window shade, but include the highest quality and elegance. This combination transforms an area into a romantic and tranquil environment. Roman shades are inspired by the décor of the Roman Empire. Raoman royalty only used rich and eccentric fabrics that were best suited for them. Now you can use these shades in your own home or office as well. Providing reliable performance and easy operation, custom Roman shades are the perfect solution to dress up your windows and add luxury to your space. Uncovered windows significantly increase energy costs. Fabric Roman shades block the sun’s rays and create an insulating barrier between your space and the outdoors, helping prevent solar heat gain in the summer and reduce heat loss in the winter. If you want to maintain light flow throughout a room while still insulating and trapping heat as it enters through the window glass, consider light filtering Roman shades. Made with the finest fabrics in the industry, light filtering Roman shades add sophistication to any space. For rooms requiring more privacy and light blockage, consider blackout Roman shades, which offer a fusion between beautiful fabric and honeycomb shades. Houston Blinds For Less offers an extensive collection of premium Roman shades from top brands, such as Hunter Douglas, Levolor, Bali, Graber, Mariak, Spring Window and Mecho Shades. Choose among a wide selection of designs and stunning colors as well as fabrics like cotton, silk and even denim. You also have the option of our sleek flat or the luxurious Balloon hobbled style Roman window shades. 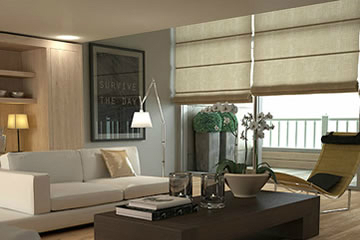 With motorized Roman shades, you can easily control one or multiple shades with a wireless remote or wall switch. You can also automate your shades with a timer or sensor. 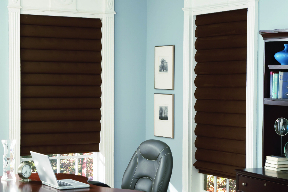 Ask about your options for motorized Roman shades at Houston Blinds For Less. All of our Roman shades are custom made to order so they fit your windows perfectly. For more information, visit our showroom in Pearland or contact Houston Blinds For Less for a free consultation at your Houston area home or office and we’ll take care of everything. We can show you our available products, explain differences between types of Roman shades, demonstrate options and features, measure your windows and take your order. Buying roman shades at Houston Blinds For Less is convenient and worry-free. Call 281-997-2100 today. Houston Blinds For Less caters to the Houston area and surrounding cities including Cypress, Katy, Sugarland, Galveston, The Woodlands, Sienna Plantation, Friendswood, Atascocita, Kingwood, Webster and more. Our name says it all, without compromising quality!